Seriously. Strymon. Seriously. It was a few months ago I was blown away by a BlueSky demo. Seems odd to be blown away by a reverb demo, but it really impressed me. After receiving the BlueSky, I was impressed even further. Strymon is a company doing fantastic things with pedals. For those of you that aren’t familiar with Strymon. Stop now. Click here, then come back. Those of you too lazy to click, I’ll explain more here. Strymon takes all the good things about digital and analog stompboxes and puts them together. Instead of using a DSP (digital signal processing) chip to do a million tones and effects (ala multi processor unit), Strymon focuses on a specific effect and go into crazy detail. They wrap that up with good footswitches and standard pots to dial things the way you want. For a while now, I’ve been hearing great things about the BlueSky (first hand knowledge.. this thing is great) and the El Capistan tape echo. But, the other day, I saw this video on the TimeLine, which they’re calling it a ‘Inspriation machine’. And after what I saw, I believe it. This pedal is only available as Pre-Order, but I’ve been hearing a few people owning it. So I would assume it’s available very soon. The price tag is up there, but for what it does, I think it’s not too bad at $449.00. Let me know what you think by commenting! There are a few more vids out there, but wanted to start with this one first. Strymon released their first batch of these back in July. They sold out in minutes! I got their email at 7pm when they went on sale. In the time it took me to click on their link to the site and get to the Timeline page they were already sold out! The next batch was supposed to be done “in a few weeks” according to their blog, but its now been several months! The irritating thing is that those who did manage to get hold of 1 (or more) immediately started selling them on Ebay at a hefty profit. 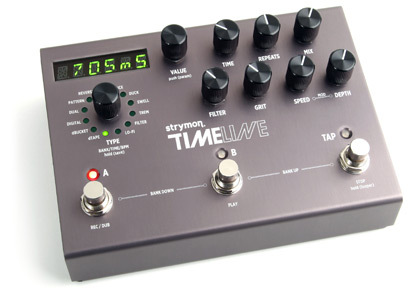 I just want to know which is your perspective if you compare the strymon timeline Vs Pigtronix Phi Echolution? I’m interested to get one of them but I’m not really sure about that and I don’t have the way to make a test of them.